Toyota's unusual discount may be the best graduation gift you can get. Toyota wants new customers with bright futures. And is willing to pay for them. At least that's our take on the Toyota College Grad discount. 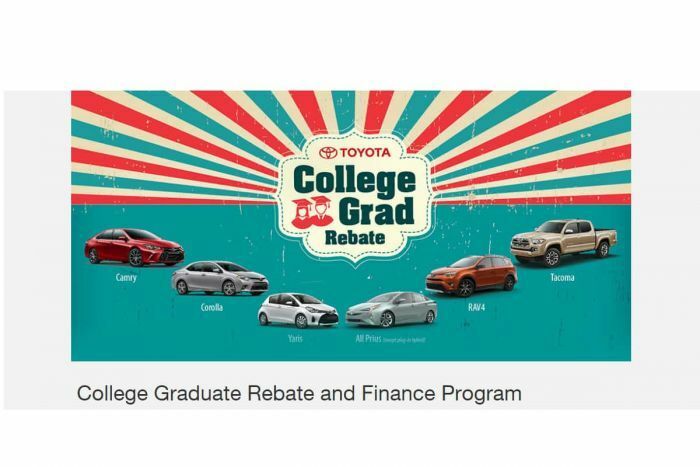 If you are about to graduate from college or have done so in the past couple of years, Toyota will give you $750 back on the vehicles that most college grads in a Toyota dealership are drawn to. Prius, RAV4, Corolla, Camry, Yaris, and yes, even the Tacoma qualify. If you are a recent grad and you desperately want an Avalon like your aunt has, they may be able to help you out, but the College Grad discount may not help you. Our sources tell us that Toyota is offering steep discounts and heavy incentives to move vehicles and those sources are Toyota's direct competitors, so it's sort of hard to imagine how that information can be untrue. You can read over all the fine details at Toyota's information sheet on the program. In a nutshell, Toyota will want you to prove you are graduating or already have, will want you to show proof that you have a job, and they also want you to talk to them about financing. The program does also apply to leases. And by the way, leases work great for folks just entering the workforce. Bet on yourself and get into a car that is a little more expensive knowing you can make the payments as you get promoted. Or, get a car you can more easily afford and give yourself an easy way to get out of that car and into a Lexus when everyone sees how wicked smart you are at the office and promotes you. Either way, leases work great for folks who will be in a car for just a few years. If you are one of the really smart folks who actually learned to make things in the past couple of years instead of drinking your way through a Basket Weaving degree, Toyota also wants you to have $750. Yes, recent grads of Trade and vocational schools are eligible as well.